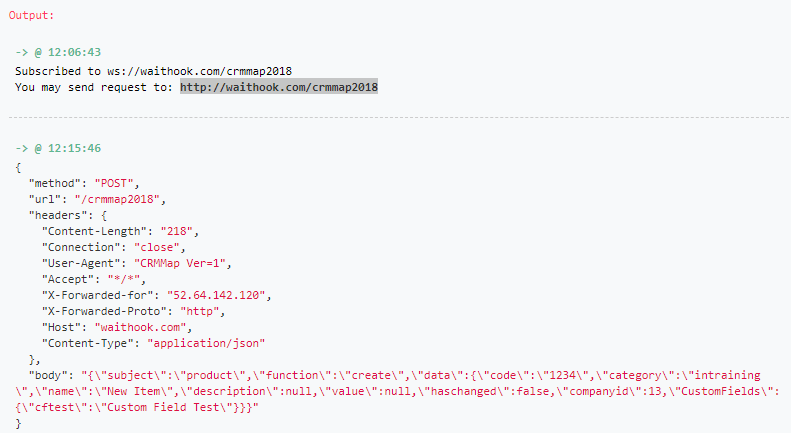 CRM-Map callbacks let you setup custom HTTP web-hooks. Allowing you to extend CRM-Map even further. Coupled with the CRM-Map API there is no limitation to the functionally you can add to CRM-Map. Call backs are currently handled by HTTP POST Requests, with the information in a JSON data format with-in the body. At the bottom of the page, in the Path Prefix field take note of what is there, or supply your own. In the output window you will see the URL that is waiting to receive requests. You will use this URL next in the CRM-Map Setup. Log in to CRM-Map if you are not already. Can selected which messages your required to be send to the web-hook. You can see the JSON Data in the body of the output. Now you can replace the Callback URL with the endpoint to your own solution. Please don’t hesitate to contact us if you have any questions or are unsure how get CRM-Map to complete your company’s solution.